Winner of the 2011 Australian Shadows Award for best collection. Aurealis and Ditmar award nominated horror author Brett McBean (The Last Motel, The Familiar Stranger, The Mother) continues his exploration of the dark side of the human character by bringing you twenty-one tales of sin and madness. From zombies roaming the Australian outback, to psychopaths roaming New York City, McBean plunges the depths of human depravity, and delves into a sick and sordid world of serial killers, Manson-like cults, even road kill and cheap souls. So pull up a seat in front of the campfire, grab a marshmallow or two, and come and take a journey into the heart of darkness with one of Australia’s leading voices in dark fiction. This new edition contains six extra stories not published in the previous hardcover edition. In this, his first-ever collection, Aurealis and Ditmar award nominated horror author Brett McBean (The Last Motel, The Familiar Stranger, The Mother) continues his exploration of the dark side of the human character by bringing you fifteen tales of sin and madness. From zombies roaming the Australian outback, to psychopaths roaming New York City, McBean plunges the depths of human depravity, and delves into a sick and sordid world of serial killers, Manson-like cults, even road kill and cheap souls. So pull up a seat in front of the campfire, grab a marshmallow or two, and come and take a journey into the heart of darkness with one of Australia’s leading voices in dark fiction. Included in this collection are eleven reprints, and four previously unpublished stories, as well as story notes accompanying each tale. 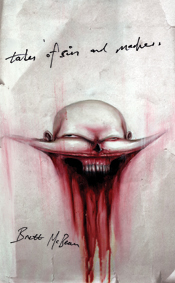 Tales of Sin and Madness was published as a limited edition hardcover by US specialty press Thunderstorm Books in 2009. Any news on the trade paperback edition? I’m pleased to say that yes, there will be a trade paperback edition, possibly released later this year. It won’t be published by Thunderstorm Books (hope to announce the publisher soon), but I can say it will be an updated version of the HC, containing more stories, so it’ll be a complete collection of every short story I’ve had published (and some that haven’t) – all in a nice affordable edition!